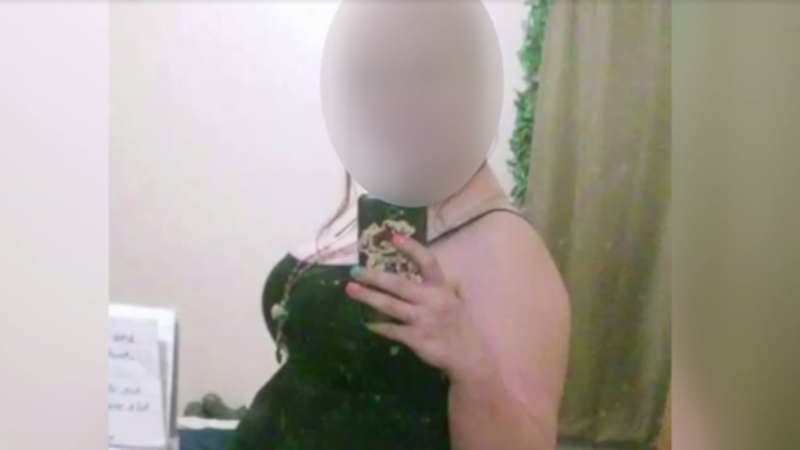 Boyfriend of teen who faked pregnancy with triplets got suspicious when she hit 10 months. This would make great college essay material. A teen from Wyandotte, Michigan used a website called "Fake a Baby" to convince her friends, family, and her boyfriend that she was pregnant with triplets for a whole ten months. She took things incredibly far, receiving donations from a church, a non-profit, and a Facebook group called "Moms of Triplets." She also named the triplets Ivan, Alice, and Isabella and had a baby shower where people brought her a bunch of gifts. Here's a selfie she took of her "belly:"
A good party gag would be to have someone punch it. A cake baked with deceit. Upon hearing the news, her boyfriend started looking for jobs, and was ready to dedicate his life to their kids. When interviewed about the situation, he told reporters that she explained her 10-month-pregnancy as being the result of a doctor wanting to prevent her from having a "micro-preemie," which doesn't make any sense because preemies come out early, not late. Things started to unravel when her boyfriend's family couldn't contact any of the doctors she claimed to have visited. Someone on the Facebook group then realized that the ultrasound pictures she was posting were from Fake a Baby. Yes. This is the most logical thing to do to get someone's attention. This Microsoft Word 2003 formatting is making me cry. The person from the Facebook group contacted the boyfriend's family, who then called the authorities. When detectives visited the 16-year-old, she cracked. She claims that she lost the babies at six weeks and was too scared to tell people, so she chose the path of carrying out a long, unsustainable con. There's a chance that she was never pregnant at all, but then again, if you're going to fake a pregnancy, why would you claim to have triplets? If it were me, I would've skipped town and started another fake pregnancy somewhere else. I'd just keep doing that, living out the life of a transient, pregnancy-faking con woman. Then I'd accidentally fall in love with one of the boyfriends I was conning, and it would challenge my transient, crime-fueled lifestyle. My life story would then be turned into a rom-com called Out for Delivery, and it'd get lukewarm reviews.